Inspired by Ted Scannell's 4mm scale work, I've been experimenting with Nigel Lawton micro motors. 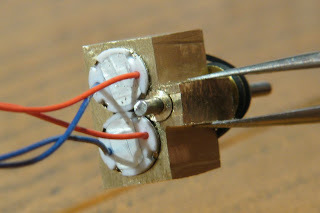 The motors are 6mm diameter by 10mm long, and nominally rated at 6v. By putting a pair in series driving the mechanism, this doubles the power and neatly gets them to 12v. Nigel Lawton also supplies belts and pulleys, which can give an easy 3.6:1 gear reduction. I calculated that a block of metal to carry two motors and a layshaft would be smaller than a typical Tenshodo/Mashima small motor. And the shaft would be at a lower height, suitable for running onto a worm/wheel directly to a driving axle. The total box volume is 17 x 13.7 x 10. But that includes the pulleys and the layshaft. The wider upper part is 13.7 x 10 x 7.3mm thick, and could be thinned further in height and width. The layshaft protrudes a further 2.2mm below the main block and is 4mm wide. ( Yes, the drive belts are too slack and I need smaller ones. My mistake on the original calculations and new ones are on order ). 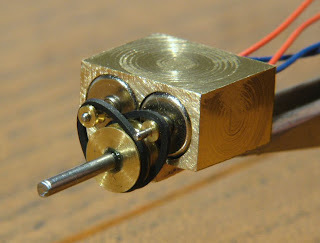 The motors are friction fit into 6mm diameter holes through the block. The layshaft is in plain brass bearings; they are DIY ones, 3mm O/D by 1mm thick, but I think Association parts would fit. The hole through the block is 2mm O/D, so that a shaft only touches at the ends when supported. 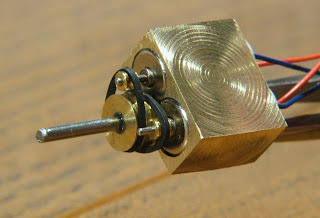 I may substitute 3mm O/D by 1mm I/D ballraces later (and then sleeve a 1mm shaft up to 1.5 for the pulleys). For those of us that weren't paying attention last night (me) are the motors friction fitted in the block or did you glue them. Also the bearings for the pulley shaft are they 2mm Association ones? Its very neat, I may have a go myself to power a tram engine etch I plan to build soon. I remember seeing an O gauge tug'o'war contest on 'Ravensbeck' at a Keighley Show. A chap had a NER Atlantic with twin RG7's in a vee set up and it was beating all-comers.